We are delighted to announce that David Tennant, who plays the title role in Patrick Marber’s Don Juan in Soho, will be joined by Adrian Scarborough as Stan and Gawn Grainger as Louis. 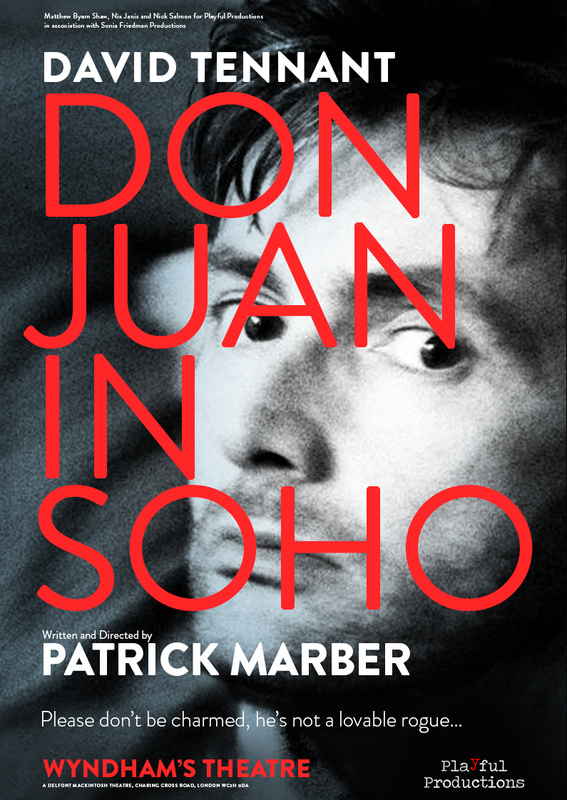 Written and directed by Patrick Marber Don Juan in Soho will open at the Wyndham’s Theatre on 28 March 2017 with previews from 17 March 2017. Don Juan in Soho will complete its eleven week run on 10 June 2017. Adrian Scarborough (Stan) was last on stage as The Fool in Sam Mendes’ production of King Lear at the National Theatre where his many credits also include After the Dance, The Habit of Art, Time and the Conways, Henry IV Parts 1 & 2, The False Servant, Rosencrantz and Guildenstern are Dead, The David Hare Trilogy, The Day I Stood Still and The Wind in the Willows. In the West End his credits include Betty Blue Eyes and Humble Boy. He has also been seen in Hedda Gabler at The Old Vic, Platonov and Vassa for the Almeida Theatre Company and Accidental Death of an Anarchist and To The Green Fields and Beyond for the Donmar Warehouse. His film credits include On Chesil Beach, Les Misérables, The King’s Speech, Elizabeth: The Golden Age, Notes on a Scandal, Vera Drake, Gosford Park, The History Boys, Bright Young Things, The Madness of King George and Dirty Pretty Things. Scarborough’s many television credits include two series of Blunt Talk opposite Patrick Stewart, Stella, Crashing, Miranda, Up The Women, Professor Branestawm, Plebs, Edge of Heaven, Death in Paradise, The Paradise, Restless, Doctor Who, Mrs Biggs, Upstairs/Downstairs, Gavin and Stacey, Cranford and Psychoville. Gawn Grainger (Louis) was most recently on stage in The Entertainer for the Kenneth Branagh Theatre Company at the Garrick Theatre. His other theatre credits include The Cherry Orchard at the Young Vic, Macbeth at Shakespeare’s Globe and The Recruiting Officer at the Donmar Warehouse as well as Onassis, Absolutely Perhaps and The Crucible all in the West End. For the National Theatre where he was part of Olivier’s South Bank inaugural season, his credits include Three Days in the Country, A Woman Killed With Kindness, Some Trace Of Her, Sing Yer Heart Out For The Lads, The Passion, The Seagull and The Misanthrope and at the Almeida he has been seen in No Man’s Land, Party Time, Mountain Language and The Last Days of Judas Iscariot. His film credits include Blood Royal, Christmas Carol and The Little Drummer Girl and on television Labyrinth, The Nativity, Big Deal, The Black Tower, Dalziel and Pascoe, The Darling Buds of May, Foyle’s War, Gentlemen and Players, Hail Caesar, Heart of the Country, Helping Hand, Hetty Wainthropp Investigates, Macbeth, Man at the Top, Men Behaving Badly, Merlin and Midsomer Murders.